My Works Montessori offers online video lessons for parents at a reasonable price. I was really excited to have them as a sponsor for Montessori Candy. 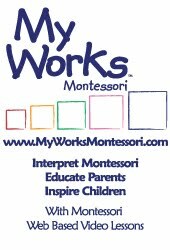 My Works Montessori was started by Montessori moms: By moms for moms (my husband says dad's too!). I can easily say that any person interested in Montessori as an option for their children will benefit. Whether enrolling them in a Montessori school, doing Montessori homeschool, or just applying a few of the activities with the little one's at home, My Works Montessori is a great and easy way to get started. 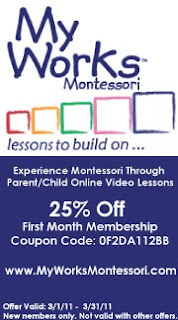 For the month of March, My Works Montessori has a 25% off special for the first month of membership for new members. Check out the ClassMate Electric Pencil Sharpener by Staples! Our old pencil sharpener gave out on us and my husband just bought us this one. My favorite thing about it? You can turn the dial to sharpen various sizes of pencils! This even sharpens those lovely JUMBO pencils that are so great for the little one's to use! We are loving it! As a practical life activity, you can set up a tray and have the children sharpen their pencils the "old school" way. They can sharpen the pencils over a little bowl and when they are all done they can toss the shavings in the trash. Just make sure you test out the old fashioned sharpener first to make sure it works properly before presenting the activity. Do you use an electric or "old school" pencil sharpener in your home school? I am happy to announce Montessori Education Supplies as a new sponsor at Montessori Candy! I have already had the opportunity to see the quality of some of their materials, and I can happily say that I think it is great! As a reader of Montessori Candy, you can enter code MC20 to redeem a Free Gift on your first order...PLUS 10% off your first order by entering code FIRST2011. Check them out!